At the moment, lots of businesses are going the extra mile to reduce their carbon footprint. Blenheim Palace is in a league of their own. Celebrate National Energy Saving Week (21st – 27th January) by visiting Blenheim Palace in Oxfordshire; the UNESCO World Heritage Site is among the UK’s greenest attractions. With over 300 years of history boasting world-famous landscapes, Blenheim believes it is their duty to preserve, protect and share the natural habitats and species that thrive across their estate. Blenheim has committed to ambitious sustainability goals, including a pledge to become a net generator of green energy within 10 years. They have invested extensively in bio-mass boilers, hydroelectric turbines, and a huge number of energy-saving programmes across the Estate. Ensuring that 80% of all food sold on site comes from within a 50-mile radius. More than 60% of Blenheim’s total spend is done within 20 miles of the Estate. Plastic straws have been replaced with paper ones in all restaurants and cafes. No plastic water bottles are being sold on site, and Blenheim water’s glass bottles are made of 80% recycled glass. Take-away cutlery is made by ‘Veg-Ware’, a 100% natural and biodegradable product. All heavy-duty bin liners are 100% natural and biodegradable. Reusable, locally-sourced cups and bags for life, made from jute, are available in their retail outlets. In 2018 the Estate introduced a fleet of green electrical vehicles and made the switch to sourcing all energy from renewable sources. 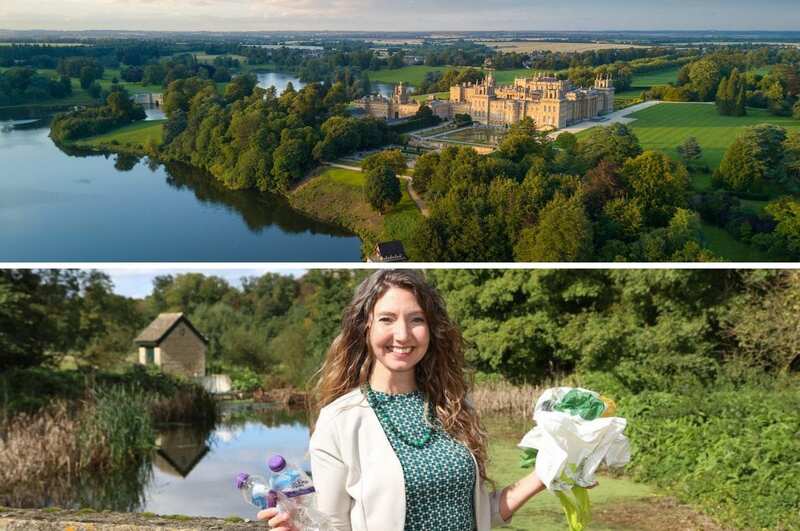 Blenheim Palace and Estate have done so much to reduce their carbon footprint, it’s no wonder that tourism awards are starting to take notice. In Summer 2018, Blenheim won a Green Tourism Gold Award. In December 2018, Blenheim won Gold in the Beautiful South Awards’ Responsible, Ethical and Sustainable Tourism Award. Discounted day tickets to Blenheim Palace are currently available from the Oxford Visitor Information Centre. If you are travelling to Blenheim, help their eco goals by travelling sustainably. Bus tickets are available from the Oxford Visitor Information Centre on Broad Street, Oxford. Tag us in your eco-friendly travels with the hastags #ExperienceOx and #greentourism.